EASTBOURNE, England (AP) — Novak Djokovic converted his fourth match point to beat Donald Young 6-2, 7-6 (9) Thursday and advance to the semifinals at the Eastbourne International. The top-seeded Djokovic saved two set points, on Young’s serve at 5-4 and on his own serve in the tiebreaker, and clinched victory with a return winner. 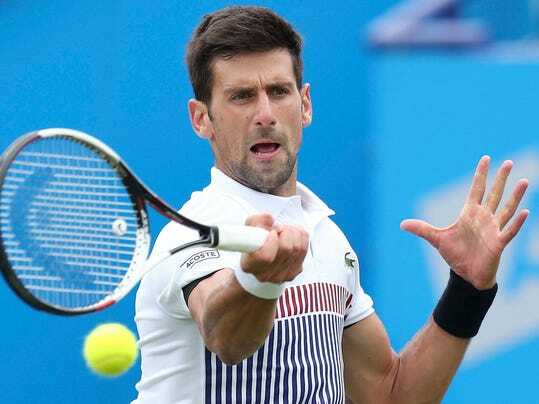 Djokovic will play either fourth-seeded Steve Johnson or Daniil Medvedev in the semifinals of the Wimbledon warm-up tournament on England’s south coast. Johnson and Medvedev were among the second-round winners Thursday, along with second-seeded Gael Monfils, third-seeded John Isner, Richard Gasquet and Bernard Tomic. Simona Halep, Caroline Wozniacki and Karolina Pliskova advanced to the quarterfinals in the women’s tournament.